When you already have the world’s number one selling premium mascara, it’s going to take quite a feat to top yourself – but Benefit Cosmetics was up for the challenge. With the release of their Roller Lash mascara earlier this year, the Benefit team was looking for a way to educate buyers about their new product while giving them a chance to experience it up close and personal. 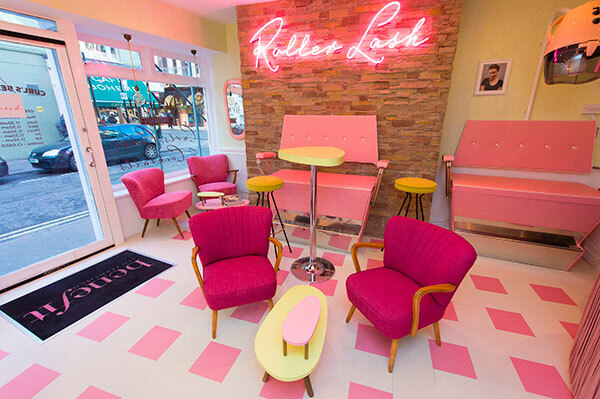 The innovative Roller Lash mascara brush was developed to mimic the action of a hair curler – picture a scene from a 1950’s beauty parlor and you’ll understand the brand image that Benefit wanted to project for their product launch. This strong visual gave the UK PR & Events team an exceptional idea for providing that personal interaction to their customers. Kyra Oates is head of PR & Events for Benefit Cosmetics UK. She says, “When we found out we were going to launch a new mascara, we knew we had to make a pretty big deal about it.” By big deal, she was thinking on the scale of a pop up bar in London’s Soho complete with specialty cocktails and cupcakes on the first floor, a salon on the next, and a completely separate, more secretive evening bar on the top floor. The public was invited to then come experience the product firsthand in this swanky, social environment. The task for the PR & Events team then became twofold. First, they needed word to spread in order to reach as many people as possible. Second, the team needed a way to manage the flow of people through the experience. 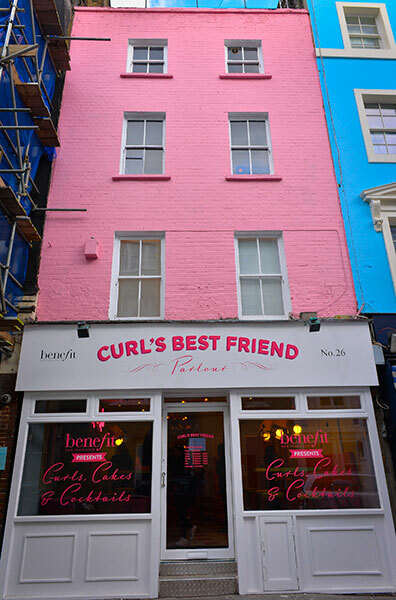 They didn’t want to excite people about coming to the “Curls Best Friend” Bar only to have them turned away due to a lack of space. With the help of Guidebook, Benefit was able to create a custom mobile app for their campaign that included the brand’s imagery and colors, information about the bar itself and – perhaps most importantly – a way for people to book appointments for the experience. With integrated social media and easy appointment booking, the app served as a social center for the entire event. Customers were able to interact with and perpetuate the company’s message, and the PR & Events team were able to easily gauge and regulate the number of attendees on any given evening. In addition to social media and appointment booking, participants could upload photos to a shared photo album and learn more about the engaging staff members that were bringing the experience to life. Using an easy-to-update app platform like Guidebook allowed the mobile guide to evolve along with the experience. Kyra, her team and the staff at the bar were able to give feedback to the Guidebook team and make the experience better for everyone as they went. “We worked really closely with Guidebook along the way to let them know what was working and what needed to change. The team are really flexible and worked with whatever feedback we gave each day. They really helped us,” Kyra said. As for getting app downloads, Kyra found that people were inclined to download the app because it was the primary method by which people could book appointments to visit the bar. They were able to leverage social media to get even more downloads by tweeting out when they only had several appointments left. 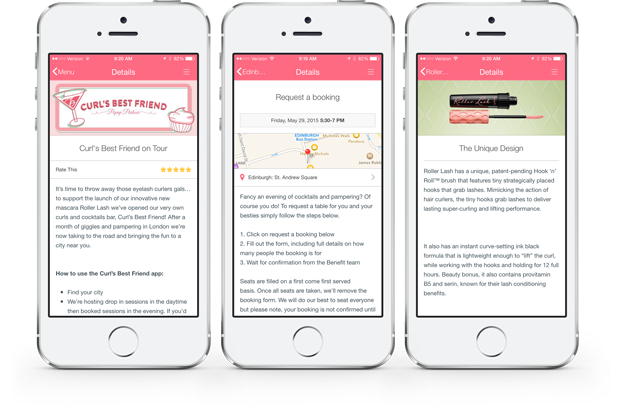 Curl’s Best Friend went on tour and the app evolved yet again to support a multi-city adventure. As the team traveled to pop up locations in Manchester, Birmingham, Edinburgh, and Cardiff, customers were able to continue booking appointments in their respective locations and learn more about the product and its launch with the help of the app. For Benefit’s innovative use of Guidebook, gold was awarded for “Best Mobile Marketing Campaign” at 2015’s Meetings Industry Marketing Awards. And who could argue with stats like these? Consumers are craving more personal experiences from brands and, just like in the case of Benefit, Guidebook is helping to build the bridge between people and the products with which they want to engage.